Now, more than ever, international experience is critical. Working abroad can fast-track your career, broaden your professional capabilities, increase your pay and expand your personal horizons. And for recent graduates, working overseas may be the single greatest opportunity to land a job that not only pays the bills, but launches you on a successful career track. 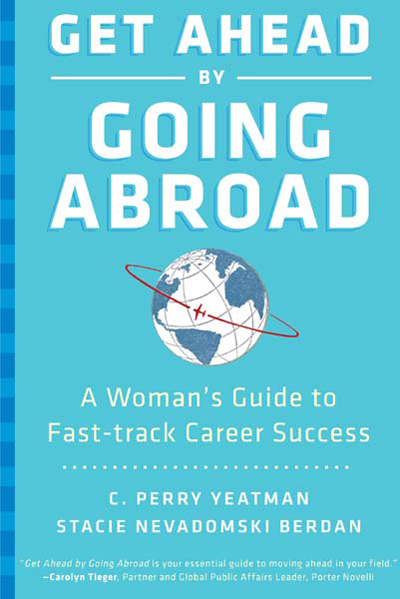 Get Ahead by Going Abroad is the go-to resource that reveals how women, single or married, can leverage this trend to showcase their skills and move up quickly on their own terms. Written by two women who did so with huge success, the book is packed with candid, instructive anecdotes and examples from their own and others’ experiences, and step-by-step guidance for securing and succeeding in an international position. The book covers all the essentials from negotiating the best contract to navigating a successful return. Stacie Nevadomski Berdan and C. Perry Yeatman show how women at every level can benefit from an overseas posting: young professionals seeking to break out from the pack, mid-career women interested in new challenges with increased responsibility, or senior executives in pursuit of positions in executive management. Get Ahead by Going Abroad helps you get further, faster—and have fun along the way. It gives you the strategies to land the assignment, thrive in the job and enjoy the lifestyle abroad.